Optic neuropathy occurs in about 6% of TED patients. Inflammation and congestion at the orbital apex are severe enough that the optic nerve and its blood supply become compressed in the confines of the bony orbit. Progressive expansion and congestion of the orbital tissues can lead to further stretching of the optic nerve. In most cases, vision loss is insidious, progressive, and typically bilateral (usually asymmetric). Dyschromotopsia is an early sign of optic nerve dysfunction. Common visual field deficits are loss of vision or central or diffuse visual field depression. The appearance of the optic disc is often unremarkable but can be edematous or atrophic. If disease is asymmetric, an RAPD may be present. Figure 24: Compressive optic neuropathy. This sequence shows a series of CT scans from patients with compressive optic neuropathy, with their associated visual fields. This may be primary treatment, or a temporizing measure, until surgical decompression can be performed. In non-emergent cases, steroid treatment (100 mg oral, tapering by 10 mg/week, for a total of 12 weeks) has been shown to be as effective as orbital decompression . IV methylprednisolone can be used in management of both emergent and non-emergent cases of optic neuropathy. High-dose IV methylprednisolone (830 mg weekly for 6 weeks, followed by 415 mg weekly for 6 weeks) in pulsatile administration is more efficacious than oral corticosteroids . When cumulative doses exceed 8 g, measure liver enzymes and test liver function, as fatal hepatotoxicity has been reported . This may be an alternative treatment to avoid extensive side effects associated with corticosteroid use . Numerous studies have demonstrated the effectiveness of ORT . Over a 2 week time course, 2000 cGy are administered over 10 treatments. This reduces extraocular muscle width near the orbital apex and may avoid need for urgent surgical decompression. There is concern for an initial inflammatory response with ORT, which can worsen compressive optic neuropathy . Fat may become more fibrotic after radiation, making decompression less effective post-radiation. If vision loss is rapid and progressive, surgical orbital decompression may be required to relieve pressure on the optic nerve and its blood supply – typically after a failed trial of corticosteroids. This invasive procedure involves removal of bone and sometimes adipose tissue to provide access to space outside the orbit, which allows excess tissue to decompress from the confined orbit. Partial- or full-thickness inner aspects of the zygomatic bone and greater wing of the sphenoid bone are removed, which is typically performed through a canthotomy with inferior cantholysis. Potential complications include cerebrospinal fluid leak secondary to dural tear, pulsatile exophthalmos, and oscillopsia . Segments of the ethmoid bone are removed allowing intraorbital contents to expand into the ethmoid air cells. The lateral wall of the sphenoid bone may be removed as well. The approach may be external or endoscopic. When an external incision is made, it is typically transcaruncular and/or an extension of the orbital floor decompression incision, when applicable. Diplopia secondary to alteration of globe position may occur. 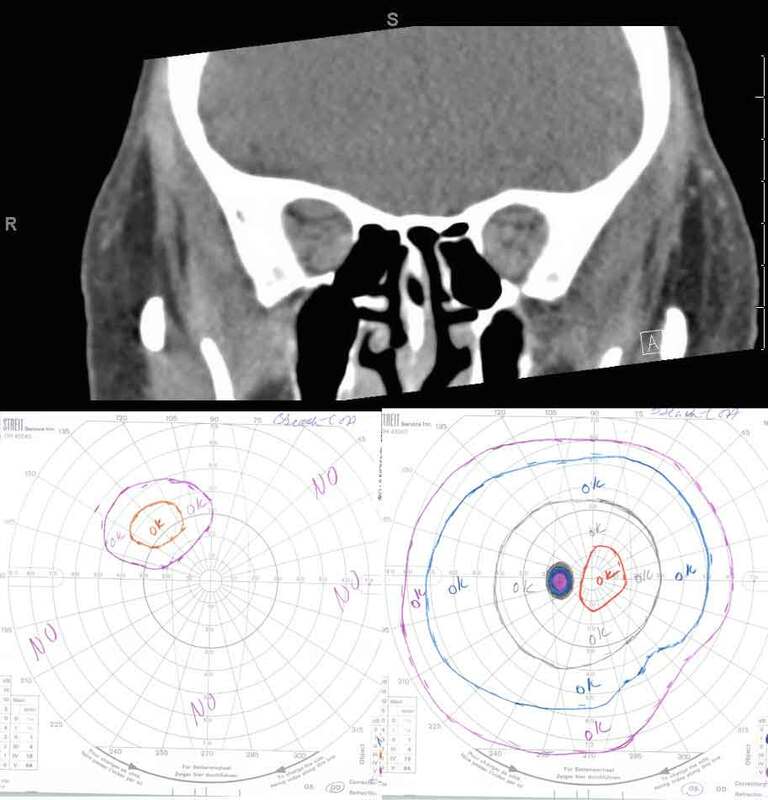 Medial rectus prolapse into the ethmoid sinus can cause an abduction deficit. Compression of the lesser wing of the sphenoid can cause internal carotid artery laceration or optic nerve damage. This allows for expansion of orbital contents into the maxillary sinus. Decompression may be performed just medial to the infraorbital nerve (largest area with the most benefit in decompressing the optic nerve) or may be both medial and lateral to the infraorbital nerve. The optic strut is often left intact to minimize globe displacement. Caution must be taken to avoid the infraorbital neurovascular bundle, which traverses the infraorbital canal. Decompression is typically performed through a transconjunctival incision with a lateral canthotomy and inferior cantholysis, but a subciliary approach is used as well. Potential complications include diplopia secondary to globe ptosis, supraduction deficit from inferior rectus prolapse, and CN V2 - distribution hypoesthesia. The orbital fat may be removed alone or in conjunction with bony decomposition. Orbital fat decompression has been shown to be especially beneficial in patients who tend to have more orbital fat hypertrophy than EOM involvement, which is more common in patients < 40 years old. This may help confirm the diagnosis of TED. 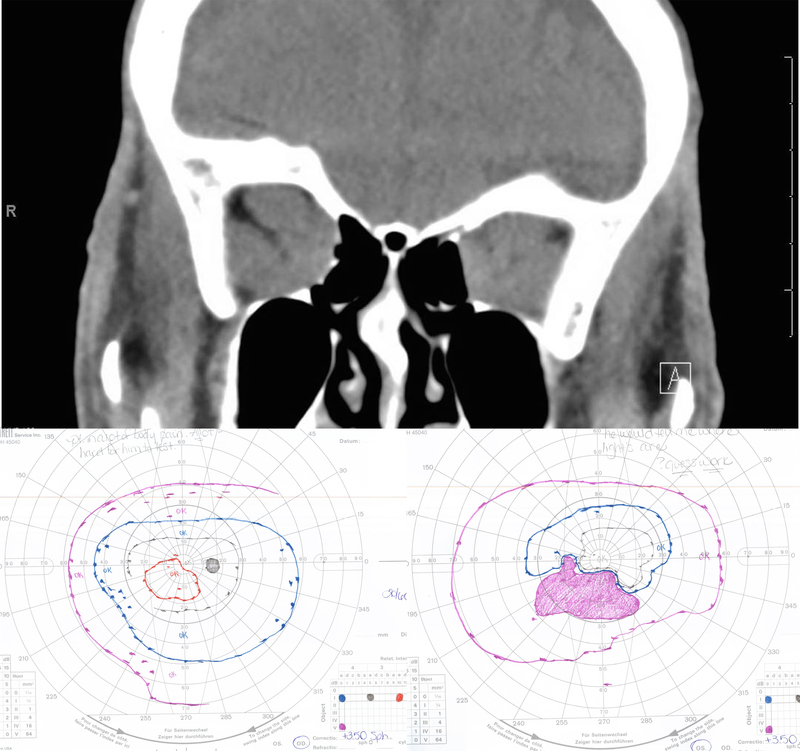 CT allows for evaluation of the anatomy of the sinuses, cribiform plate, and lateral wall of the orbit. CT also helps assess the potential benefit of fat and bone removal. Decompression may be of any wall alone or in combination with other walls. The medial wall and orbital floor decompressions are of the most benefit in compressive optic neuropathy but have a slightly higher rate of diplopia post-operatively. The decompression is called "balanced" when the medial wall and lateral wall are included. Studies have shown that the balanced decompression has lower rates of diplopia as compared to decompressions involving the floor. If digital repositioning fails, a Desmarres retractor (or if not available, a large-sized paperclip, bent to form a right angle (similar to a laryngoscope)) can be used to navigate between the upper lid margin and superior rectus to allow for proper repositioning. Lateral tarsorrhaphy or orbital decompression surgery may be necessary, if initial managements fail. Patients at high risk for corneal exposure include those with a combination of proptosis, eyelid retraction, lagophthalmos, neurotrophic cornea, and poor Bell's reflex. Pathogenesis is centered on prolonged exposure of corneal surface, leading to corneal drying, which decreases vision and threatens barrier to infection. Treat emergent cases when corneal integrity is threatened. The cause of the exposure must be corrected, and more aggressive therapy is pursued to provide protection and moisture in the meantime. A bandage contact lens (BCL) or scleral contact lens with concomitant topical antibiotic will protect the cornea from further drying, while also preventing infection. Orbital decompression increases the volume of the bony orbit through removal of orbital bone and adipose tissue and allows a proptotic globe to recess back into its normal confines. It is considered first-line therapy for cases of severe optic nerve compression. Because decompression surgery can alter globe positioning, decrease eyelid retraction, and affect extraocular motility, it should precede any extraocular muscle or eyelid surgery. Orbital decompression can reduce proptosis and eyelid retraction . See the "Emergent Treatment" section above for more information on orbital decompression. Figure 25: Exophthalmos. The globe is displaced anteriorly out of the orbit. This is an ophthalmologic emergency – the cornea is at risk for exposure, and the optic nerve is at risk of irreversible damage. TED affects extraocular muscles in a predictable manner . The inferior rectus and medial rectus are most commonly involved. This presents as hypotropia and/or esotropia. Most TED patients with diplopia due to strabismus will not require surgical intervention, as most can be effectively managed with prism spectacles . Patients may have intractable diplopia in primary gaze or with reading. Abnormal head positioning may be present. The position of the globe may be cosmetically unacceptable. Delay strabismus surgery until disease stability has been demonstrated. Recession of the affected muscles is the most commonly used surgical method. Adjustable sutures are helpful in especially difficult cases. With recession of the inferior rectus muscle, infraduction deficits may result, making the use of bifocals challenging. Extraocular muscle recession can worsen proptosis . If orbital decompression is foreseeable, it should be performed prior to strabismus surgery, as orbital decompression can also alter strabismus. Extraocular muscle recession can effect eyelid position . Large inferior rectus muscle recession can result in lower eyelid retraction, which is largely due to adherence between the inferior rectus muscle and the capsulopalpebral fascia of the lower eyelid. With superior rectus recession, connection points between the superior rectus and upper eyelid elevators may worsen upper eyelid retraction. Strabismus surgery should be undertaken prior to any corrective eyelid procedures. Poor surgical candidates that cannot be treated with prisms may benefit. Restricted extraocular muscles are injected, which temporarily relieves restrictive strabismus and may have some lasting effects. Consider alternative treatment if there is need for recurrent injections, difficulty in precisely delivering the agent within the orbit, or variability of effect on fibrotic extraocular muscles. Figure 26: Eyelid retraction. Eyelid retraction is the most common presenting sign of TED, and is the result of many factors associated with TED.